Simona Faroni, President of G.S. Gelato & Desserts received the Innovation Award in the 2017 Top Women in Store Brands Program, presented by Women Impacting Store Brand Excellence (WISE) and Store Brands Magazine. The award program was created to provide well-deserved recognition for female professionals who have achieved exceptional success and bring a passion for store brands to their day-to-day activities. Simona won one of two achievement awards in this year’s categories: the innovation award. For a company that began with just two Italians with an American dream to bring authentic gelato to the United States, Simona and her husband Guido knew that with their love and passion, they would one day make a significant mark in the gelato industry. Between constant research and development, an eye for innovation, and a dedication to craft the best gelato on the market, the company’s main goal is to provide custom tailored programs and products to meet their customers’ desires and needs. To read more of G.S. 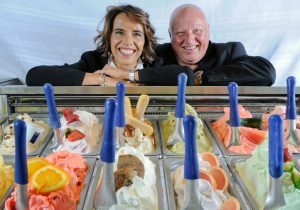 Gelato’s story and Simona’s Top Women in Store Brands award, click here.